The New Genres Grid is a standalone virtual world which was created in early 2011 by artist Max Moswitzer/Mosmax Hax, and is solely dedicated to artistic and learning activity. 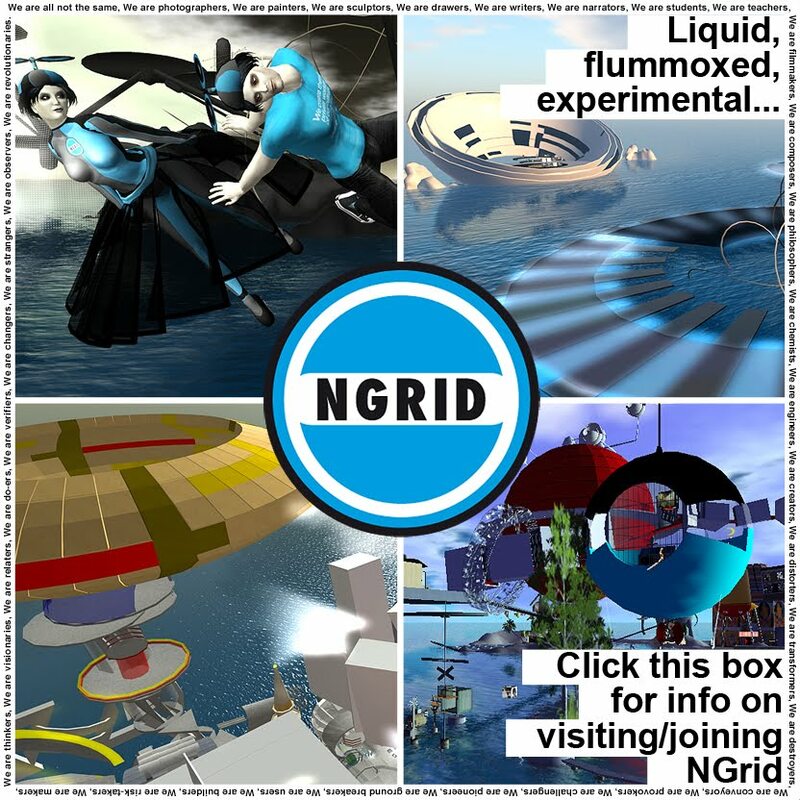 Liquid, flummoxed and experimental, NGrid is a sophisticated metaverse which was founded in search of a free building environment, akin to a real life studio in which creative activity can realize it’s uninterrupted potential, albeit in the friendly proximity of like-minded individuals. The New Genres Grid has also been chosen as the virtual seat of ISEA2011 Istanbul for its innovative art and architecture, as well as for its stance in ensuring that the highest levels of building and creative activity be maintained throughout its future, duly observed by its later residents, as much as it is by its founders. To visit NGrid with your OSGrid avatar please type hg.ngrid.org:8002:ShapeShifter in the search field of your map and then teleport! Easy as that! 1) Performance, Stability: NGrid operates under the technical expertise of Snoopy Pfeffer, the founder of Dreamland Metaverse at OSGrid, whose sims there are already famous for their stability and high performance. These same standards of efficiency are brought to bear on the workings of NGrid where all underlying software is maintained at its newest, most stable version. And given the fact that NGrid is a standalone grid, running on clean data which is fully under Snoopy's control, this provides for an exceptionally smooth working environment, with a minimum of lag and similar grievances at all times. 2) Creativity: We are seeking to build a community of serious artists/designers/builders, researchers and educators whose output is cutting edge and experimental, and who like to think outside of the box. If you think that this description fits you, and your work, please contact us at the above link. We will be delighted to welcome you in our midst and to help you as much as we can whilst you are settling in the hypergrid system, the frontier of online virtual worlds today. I have tried to reach your grid from Kitely via Hypergrid, but it fails. Message:" Unable to verify identity. hg.ngrid.org:8002:ShapeShifter does work. hg.ngrid.org:8002:ubik also seems to work sometimes. The ubik place and the sandbox associated with it are places I might report on. I don't understand the way Hypergrid addresses yet. I will keep testing.